Geraldine Ware-Roby is giving her mother a Mother's Day present on Saturday. She's crossing the stage to receive her educational specialist degree from Indiana State University. But she's not done giving. Ware-Roby, of Gary, plans to start working toward her doctorate degree in curriculum, instruction and media technology in the fall. 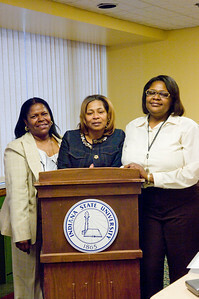 When she finishes, her mother will see her three daughters graduate with doctorate degrees from Indiana State. Augusta DeNeal of Gary and Elonda Ervin of Terre Haute graduated from ISU in May 2008 with doctoral degrees in educational leadership, administration and foundations. "They're always there pushing, pushing, pushing," Ware-Roby said with a laugh about her sisters. Ervin said they are prepared to assist their sister in reaching her goal and that it will be "awesome" when they all have their doctorates. "We're ready to help her in any way we can," she said. The educational specialist degree earned by Ware-Roby, a middle school special education teacher in Gary, prepares her for leadership positions in education. "Geraldine loves the children that she works with here in northwest Indiana," DeNeal said. "I have seen her go completely on the line for them in many, many situations. In order to be a part of the public school governing system where decisions are made about these children, she knew early on that an Ed.S. was necessary." Ware-Roby, who has a master's degree in communication from Purdue University and special education degree from Indiana University, plans to continue listening to her older and younger sisters' advice as she works toward her goal of a doctorate degree. "It's exciting because you never forget this is what you have got to do," she said. Not only is she doing this for herself, her mother, her sisters, but also for her three children to show them the way. "I'm determined to go all the way for my children so they don't stop," she said. Her daughter has completed her master's degree while her son is looking at universities to work on his. The youngest son is a junior in high school. The number of degrees accumulating in the family is noteworthy, according to one Indiana State professor. "This is truly a rare occasion," said Mary Howard-Hamilton, ELAF professor, when DeNeal and Ervin finished their doctorates in 2008. "Two sisters have Ph.D.s. For an African-American family, that is rare. I've been a professor for 17 years and I haven't had that opportunity in teaching." Each woman credits their parents, who sought a new life with opportunities for their children and encouraged them to pursue their educations. "Neither of our parents finished high school," DeNeal said. "They moved from Mississippi to Gary to get away from racism." Their parents wanted a better life for what would be their eight children. "She didn't know how to tell us to get careers," DeNeal said about their mother. "If she pushed anything, she pushed us to get an education." "Dad was a strong tower," Ervin added. "He believed in education. They wanted you to go to the max." As they grew, Ware-Roby said they were made to finish their homework every day. If they claimed to not have any, their mother told them to read a book. "Dad would work three jobs to support us," Ware-Roby added. "He said the only way we were going to make it was to get an education." Although their father died before seeing them earn their degrees, DeNeal said striving toward educational goals has made them a closer family. "We look back and realize how all of the family pulled together, encouraging each other during these 'hard' times," she said. "As a result, we all were able to finish our degrees with our mom watching us from the audience. Truly we could not have done it without her." Already eyeing her next goal of a doctorate, Ware-Roby said she didn't plan to attend ISU's graduation on Saturday (May 9). Then because of her mother and family's excitement, she changed her mind. "It's more so for my mom," she said. "We'll all be together for Mother's Day."